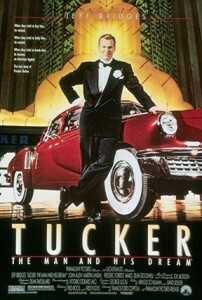 It was 25 years ago to the day (August 12) that “Tucker” debuted on the silver screen. 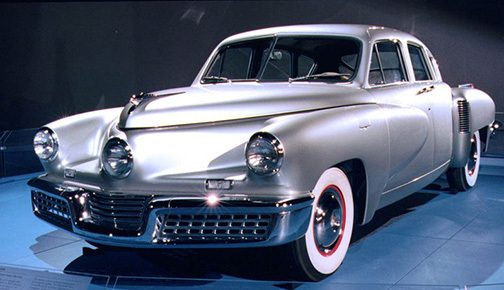 I remember seeing that movie with my father, in the theater…we were both huge antique car fans and the mystique of the Tucker wasn’t lost on us. Two hours later we were driving home in his vintage Buick Electra 225, discussing what American cars would have been like if Tucker had succeeded with his dream. Our conclusion: Detroit iron would be 10 to 20 years ahead of its time from 1948 on. The Movie: This flick was based on the true-life engineer Preston Tucker, who had a dream to start a new, technologically advanced auto company. Using designs he had been perfecting since before WW2, he managed to secure funding to start the Tucker Automobile Company. 50 Tucker Torpedos were built (plus the prototype), but the company was doomed to failure (you’ll have to watch the movie to learn why). 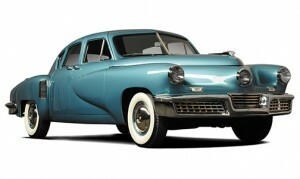 The Car: As much a character in the film as any of the actors, the 1948 Tucker Torpedo was stylistically and technologically way ahead of its time. The low-slung vehicle utilized a flat airplane, rear-mounted six cylinder engine, giving it a sleeker look than most late ’40s cars, and came standard with safety features like a padded dashboard and seat belts (stuff that wouldn’t be found on most conventional cars until a decade later). It even sported a “Cyclops eye” center headlight that turned with the front wheels. Kookie. Before this flick hit the screen, Tuckers were rare but still could be bought for around $40k if you could find an owner who wanted to part with it. After the movie, the price shot up to beyond $400k. Today, millionaires use them as toys to trade back and forth with their millionaire friends, usually in the $1.5 Mil range. Jerks. Several original cars were used in the movie…and some fiberglass molds, for the “crash” scenes. No actual cars were harmed in the filming of this movie. My Take: The movie itself is very cool, with a great 40s vibe throughout. Unfortunately 1980’s audiences weren’t “hip” to anything vintage, and unless it had a DX-7 doing the soundtrack, got panned. The movie originally grossed a few mil less than it cost, labeling it a flop. But don’t let that deter you from digging this thoroughly enjoyable flick. Dinner & Drinks: I’m thinking Iron City Beer and burgers for this one. Real workin’ man’s food.